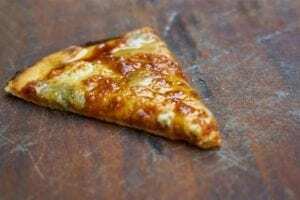 Image of a slice of cheese pizza. I got Rico some chicken so that he'd have something to eat when he got home home from school, since there's nothing I can send to school with him to eat and he won't buy or eat anything from the food trucks there. I told him the other day that I would ask his advisor if she or a teacher would be willing/able to heat a lunch I send in for him in the teachers' microwave, but I'm procrastinating because we've been here before and, even if I convince someone to help him with lunch, I know there's a 95% chance he won't eat it anyway. So I got him some chicken to eat when he got home. Unfortunately, it didn't come from any of the three Rico-approved restaurants, so he wouldn't eat it anyway. I heated up some of the Rico-approved pizza we always have in the fridge for him. I understand his behavior because I have very similar food issues, but that doesn't make it any easier or less frustrating. Then he comes to me a bit later, so sad because he can't afford to buy the Fortnite thing – bat wings or a pink guitar or something – he wants and he is sure it will be going away by tomorrow. I explain to him (again) that the people who run Fortnite do that to create urgency. They want to to make him feel like he has to get it right away, so that he will buy it without thinking about other things he could do with his money. He's still crying, so I tell him: It's okay to be sad if you want or you can try to distract yourself. Rico: But I don't know how to do that. Me: Well, you think of something else to do and go do that so you don't think about what's making you sad anymore. Rico: But I don't have anything else to do. Rico: That's too much to choose from! Now I'm overwhelmed! Me: I was just giving you ideas because you said you didn't have any. Rico: That's too much pressure! I'm so overwhelmed now. Me: Or you could just be sad. That's fine, too. I go back to the kitchen, leaving him to cry on his own for a bit. I want to give him the effing $5 but that would be way more than two steps back. This is not our first time working on this lesson, which is why he knows better than to ask me for the money. He comes back a little later, having decided to ask his brother for the money. Private is outside with a friend, so Rico can't ask him right away. Instead he stays in the kitchen, sadly verbalizing his fear that Private will not loan him the money and it will be an entire year before the object of his interest will be available again. When Private comes in a few minutes later, he agrees to loan Rico the money. Everyone is happy again. 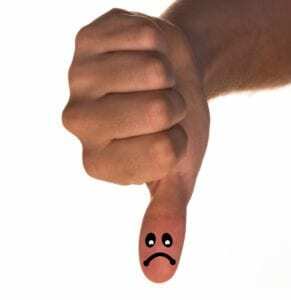 Image of a hand in a “thumbs down” motion with a sad face painted on the pad of the thumb. Except me. I'm left feeling ambivalent and tired and drained and ineffectual. So, you know, it's an average Wednesday here. How's your day?